I can’t think of a more exciting sector than legal marijuana. But like every industry, a fresh response is necessary following the honeymoon phase. For Cronos Group (NASDAQ:CRON), the company faces a critical earnings report for its fourth quarter. Although CRON stock has gained 70% this year, shares have traded flat since late January. Not only that, the company has incurred heavy volatility heading into fourth-quarter earnings. Further, significant movement in the options market suggests that traders anticipate a big move. Considering that technical momentum has dried up for nearly two months, and that analysts are skeptical of the sector’s production capabilities, it’s critical that CRON delivers the goods. On paper, the bar is set low. For earnings per share, covering analysts expect CRON stock to “break even” at 0 cents. Estimates range between a loss of a penny to a high of 1 cent. In Q4 2017, Cronos delivered EPS of a penny. But the revenue picture is likely what most investors will focus on. Sales estimates range from $6.5 million to $6.6 million, with consensus averaging $6.5 million. If management hits this target, it would represent over a 300% lift year-over-year. That’s an ambitious goal, but reaching it could do a lot of good for Cronos Group stock. Although aiming for a record-breaking $6.5 million sales haul in the upcoming quarter appears aggressive, it’s actually quite reasonable. Going back to almost two years ago, Cronos has forwarded bonkers numbers. That’s one of the reasons why CRON stock historically is such an outperformer. 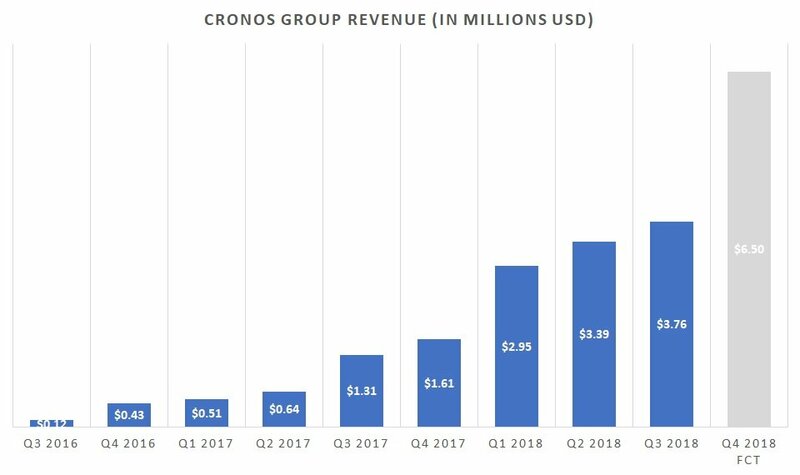 Since Q3 2017, Cronos revenue growth on a YOY basis averages 434%. Taking away this quarter’s ridiculous 963% growth, we still have an average of just under 333%. Therefore, a 303% growth target for Q4 2018 is well within established trends. That said, legal marijuana understandably has viability and practicality concerns. If CRON fails to hit its revenue forecast, that could send a ripple effect into Cronos Group stock. Wall Street may perceive such a miss as an underlying sector problem that could also affect rivals like Tilray (NASDAQ:TLRY) and Canopy Growth (NYSE:CGC). Thus, Q4’s revenue target presents a tricky situation. Yes, Cronos should reasonably attain this goal based on historical performance. But if it doesn’t, the penalty will likely be severe. Among the litany of criticisms against the cannabis industry, a common criticism is capacity. Several players have invested considerable funds acquiring marijuana production facilities. But analysts have voiced concerns that some of these buyouts don’t make economic sense. For example, consider the hoopla surrounding Aurora Cannabis’ (NYSE:ACB) acquisition of Whistler Medical Marijuana. This goes to show that capacity will always remain a highly-scrutinized metric. After all, a marijuana producer’s viability is directly correlated to how much agricultural goods it can produce. However, another important and related figure to watch is inventory. When people talk capacity, they’re talking about processed and packaged goods. It doesn’t do Cronos Group stock any good if the underlying firm sits on an un-shippable supply glut. Looking at days inventory, though, management must reign this number in. It’s not just the fact that the company reported over 748 days inventory in Q3 2018; this metric has risen uncomfortably high in recent quarters. Again, management must trim this trend. If not, I’m not sure if a good narrative can save CRON stock in the nearer-term. What’s CRON Doing with their Money? Last year, tobacco giant Altria Group (NYSE:MO) made headlines when it announced a $1.8 billion equity investment in CRON. Naturally, Cronos Group stock launched into orbit after the disclosure. But it wasn’t just about the money. Instead, Altria gave Cronos and the entire marijuana industry a credibility boost. If a big company like Altria was willing to stick its neck out, it must recognize the sector’s true potential. Specifically for CRON stock, Altria represented money growing on trees. With its massive partner’s support, Cronos can embark on its expansionary ambitions. That’s the good part. However, stakeholders don’t want to listen to bedtime stories indefinitely. At some point, they want results. Inevitably, we have the obvious question: what’s Cronos doing with the money? Boosting sales is one thing. However, shareholders also want efficient production, and eventually, a feasible roadmap to consistent profitability. Unfortunately, I’m not entirely convinced that CRON will give analysts what they’re seeking in the nearer-term. Therefore, I’d take a cautious approach to Cronos Group stock heading into Q4. The post 3 Things to Watch for Cronos Group Stock Ahead of Earnings appeared first on InvestorPlace.